It's a whole new year filled to the brim with opportunity and green blessings. The snow graced us for a short while today. Classic downy flakes drifting down and lining each bare branch with white. Then it began to sleet, halfway between snow and rain. Then hail clattered off the windows, and a gentle rain continued in its wake. 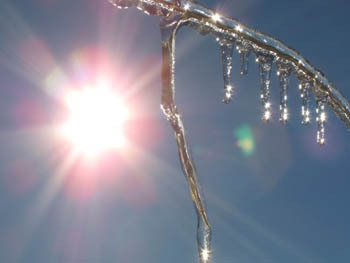 Will I awaken tomorrow to a glistening ice-covered world? Maybe. No way to know. What I do know is, there is lots of travel in my future. First I pack for the Costa Rica Wellness Adventure, starting in less than two weeks. Lots of interesting plants, smiling people, and the blue, blue Pacific Ocean await us. Then, off to . 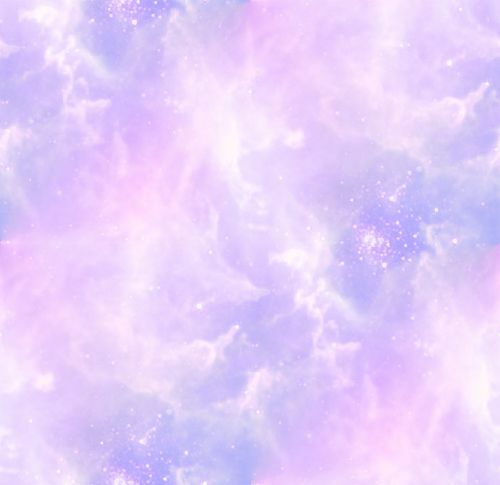 . . well, why not just take a look at my 2015 schedule! . Whether it's snowing, sleeting, or raining, the sun can shine in your kitchen. I harvested some Meyer's lemons in Arizona, brought them home, and made some ever-so-easy Honey-Lemon Marmalade. Join me as I show you just how I do it. 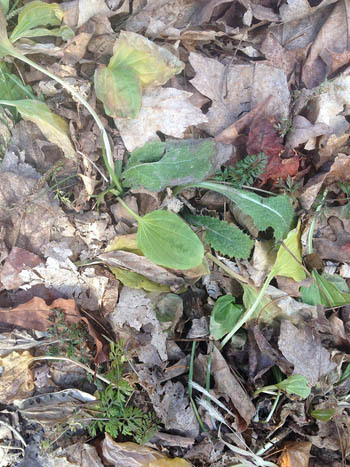 Yesterday, in anticipation of the snow, I made a wild salad with the same plants we've been eating for the past month: the hardy ones. Come on a walk with me if you want to pick a New Year Salad too. These winter leaves are tough, so I mix my wild salad into hot rice or any hot grain and then dress it with extra virgin olive oil and gomasio. Alternately, the salad could be dressed with hot bacon fat. I feel so very rich when I eat from the earth in the middle of the winter. How about you? Have you made your resolutions for the new year yet? One of my favorite resolutions was to begin my day, every day for a year, by eating something wild. In case of severe weather, I ate some seaweed. In cities I had to find tall weeds to eat my requisite leaf. (Short ones, I figured were more in the way of "things.") In the suburbs, I faced a wasteland of poisoned grass, but still found outposts of edible weeds. This resolution stretched my comfort zone. Just the way I like to live. How about you? May your new year be filled with the greenest of blessings. Until the snow falls, there are greens for salad, no matter how cold. 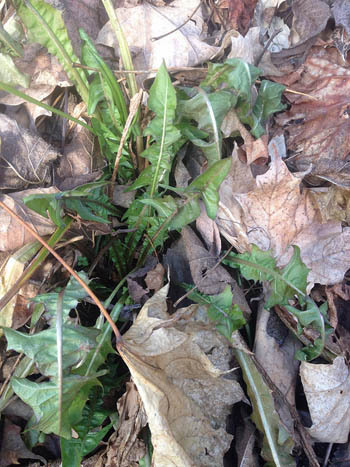 Look for these super hardy plants all winter. . . for food, for medicine, for a smile in your heart. 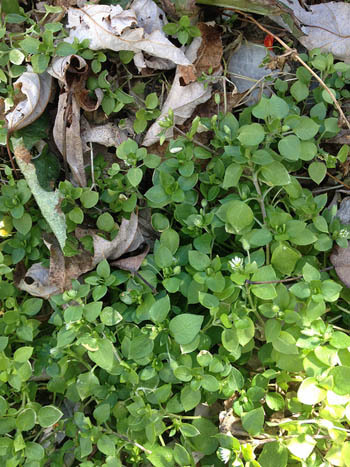 Pinch the tender tops of this little plant all winter for salad greens. You only get a half a bite per plant, but thankfully there is lots and lots of it, so it adds up as a nice addition to the tougher greens. 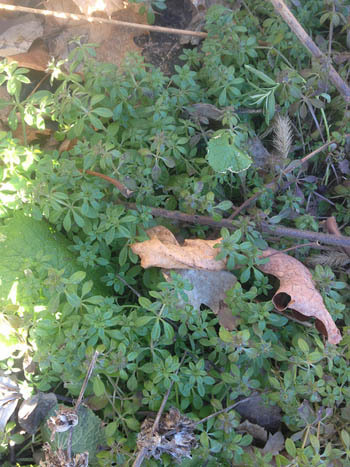 Also known as bedstraw. Truthfully, I am more likely to use scarce winter plantain as a medicine than as a food, but I did put a little in the New Year Salad, because I think it tastes like a warm fire on a cold day. Pick only one leaf per plant. And cut across the veins when preparing the leaves as food. Also known, when flowering, as Queen Anne's lace, these leaves really are wild carrot. Under the ground is a sweet root. The leaves are very rich in potassium and other minerals. 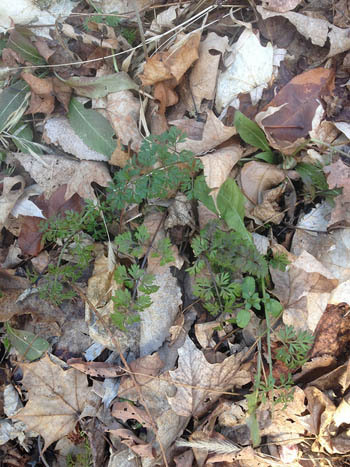 Like wild madder, wild carrot tops are one of the less tough winter salad greens. I pick no more than two leaves per plant and strip the little leaflets off the main stalk, which is too fibrous to be eaten with relish. Has dandelion been on our walk every month of the past year? Yeah. That's why dandelion is "the most generous plant." A few of these leaves in our salad will do very nicely. The colder it gets, the better the dandelions taste, to me. Good food and good medicine. 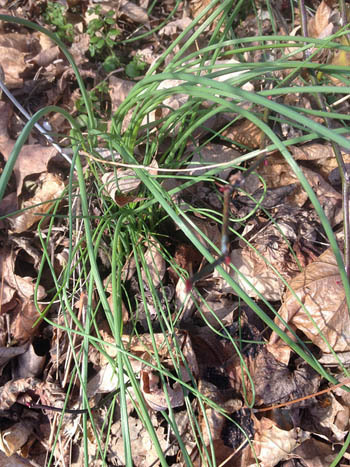 If the snow is light and accumulates only a few inches, the wild chives will poke out above it and be available for salads even in the depth of winter. Tasty chopped into butter and enjoyed on baked white or sweet potatoes. The sulfur compounds in garlic, onions, leeks, and chives deter colds and the flu. 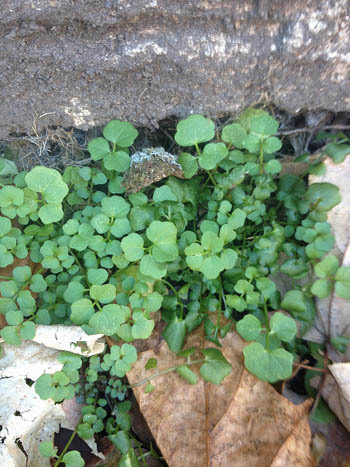 Mustard-family plants love cold weather, so look for cresses tucked into sunny spots all winter long. This lovely bunch is growing at the angle where a brick building meets the landscaped edge of the lawn. Full sun = happy greens. The taste of the mustard grows sharper as the temperatures drop. So don't be surprised by the sharp burst of flavor from our favorite weed, garlic mustard. 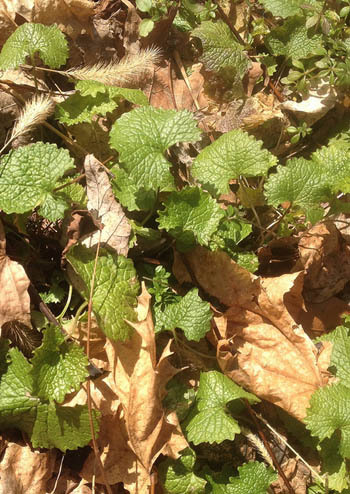 If you are still snow free – or if you look at the edge of the forest where the snow accumulates less – you can find some garlic mustard leaves and mix a handful into your hot grain tonight. Yummy! The little star lady also likes the cold. She is hanging out in planters, flower pots on city streets, and on my compost pile, which is, no doubt, warmer than the surrounding earth. A handful of fresh chickweed is just the thing I want to complete my fried egg sandwich for breakfast. 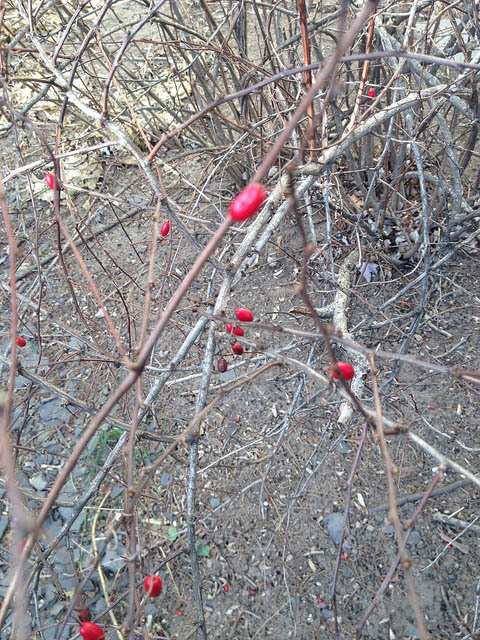 The barb-berry bush holds its tart, red berries high above the snows. Add them, like cranberries, to your salads or grain dishes all winter long for a hit of vitamin C and a trace of the active alkaloid berberine, a wonderful helper for forestalling colds.